This new, exciting product is based on the acclaimed battlemaps produced by Øone Games. 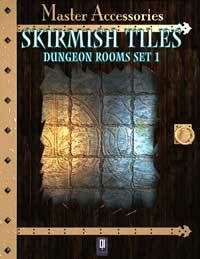 The SKIRMISH TILES are 8x5 inches dungeon rooms and corridors tiles that are suitable for any miniature-based skirmish game. Some of your favorite battlemaps have been adapted and optimized to this new format and many wonderful rooms have been added. 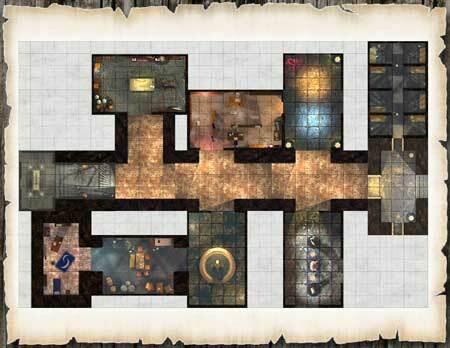 Each tile shows a superb rendered plain view of a dungeon room or a corridor without the loss of space due the perspective view. With these tiles you can easily build a battlefield for your miniature game, even printing each one more than once. The product contains 30 tiles with a black and white, ink saving version of each one, plus three pre-assembled dungeons. 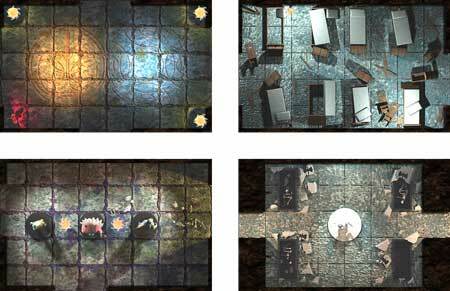 The tiles come with three pre-built dungeon you can use for quick-setup games.